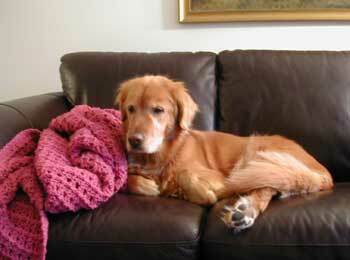 …loves a warm, cozy, crocheted blankie and a good couch. She says to tell you 7:30 am is a good time for a quick nap. how cute – she looks like she just woke up – what a cute baby!!!! Oh, would you look at that? (Oh, yeah – you did since you took the picture right?) That is the cutest picture ever! What a cool doggie….and she looks so sleepy! I think that’s the most adorable picture of a dog I’ve seen on the web or in blogland…reminds me of the dog I had growing up. Very sweet! What a cutie! I love it when they’re all groggy and cuddly. What a sweetie! Breakfast *is* most exhausting, isn’t it?